Why is Dental Care Important for Pets? People are told that once yearly dental cleanings and check-ups are extremely important for proper dental care. What we aren’t always told is how important these same cleanings are for our pets. At Virginia Veterinary Centers, we know that pets rarely receive proper dental care, which has led to 80 percent of dogs and 70 percent of cats having periodontal disease by the time they are three years old. Therefore, we are here to help pet owners understand the need for proper dental care and give them the information they need to provide it for their cats and dogs. Proper dental care will help keep your pet from developing a wide variety of dental health issues, such as periodontal disease, which is caused by the build-up of bacteria in the mouth. These bacteria form a film over the teeth called plaque. As the bacteria die, they can become calcified by the calcium in your pet’s saliva. The calcified plaque is called tartar, and it can eventually lead to gingivitis, which can lead to an infection in the root of the tooth. In the late stages of periodontal disease, the tissues around the tooth are destroyed, and the socket that holds the tooth in place erodes, which makes the tooth loose. Another common dental problem is broken teeth. Chewing on hard toys and treats like antlers and bones can break your dog or cat’s teeth. 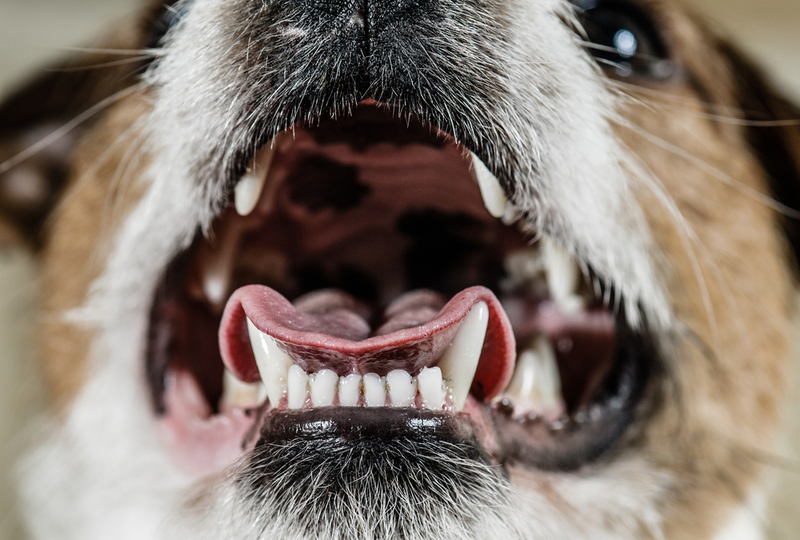 A broken tooth can expose the nerve of the tooth, which is very painful for your pet. Additionally, the exposed nerve can become infected and cause even more problems for your pet. At this point, the tooth will need to be removed. During a veterinary dental cleaning, unless unable due to a medical issue, veterinarians will put your pet under general anesthesia to protect both your pet and the veterinarian. The veterinarian will use dental tools to remove the plaque and tartar from the teeth. Then, the veterinarian will use a special polishing paste that smooths out any scratches in the enamel of the teeth. A fluoride treatment or barrier sealant will then be put on the teeth to help strengthen and desensitize the teeth, while also preventing more plaque from developing. While your pet is being seen for a cleaning, the vet will also get dental x-rays to check on your pet’s teeth both above and below the gumline. These x-rays will allow the veterinarian to see any problems that wouldn’t be visible on the surface of the tooth. The vet will also check to make sure no teeth are broken or infected. It is very important that pets go in for regular dental cleanings as veterinary dentistry can remove built-up plaque. However, there are a few things you can do at home to help keep your pet’s teeth and gums healthy as well. The best thing you can do for your pet’s oral health is to brush their teeth. Cats and dogs aren’t that different from humans, and daily brushing can prevent the build-up of tartar and plaque, which often lead to periodontal disease. While daily brushing isn’t always an easy feat, focusing on brushing your pet’s teeth frequently can save the teeth down the road. Buy pet-specific toothpaste and either a regular or finger toothbrush, and you can start brushing your pet’s teeth slowly. You will want to proceed in a manner that allows your pet to get used to the brushing. Allow your pet to lick some of the toothpaste off of the brush. This lets your pet get used to the taste of the toothpaste and the feel of the brush. The first few times, just brush the front teeth. As your pet feels more comfortable, you can start brushing all the teeth. Follow the brushing with a treat for a little encouragement. Although not as effective as brushing, you can also buy liquid and foam oral products that help kill some of the bacteria in your pet’s mouth. There are also toys and treats that can help remove plaque and tartar build-up from your pet’s teeth, but not all of these toys and treats will actually help. Be sure to speak to your vet before using any of these products for oral health. If your pet is in need of dental care in the Richmond area, Virginia Veterinary Centers can help. Our veterinary dentistry and oral surgery department can clean and monitor your pet’s teeth and gums to ensure that they are healthy. To reach the Richmond office, call 804-353-9000.